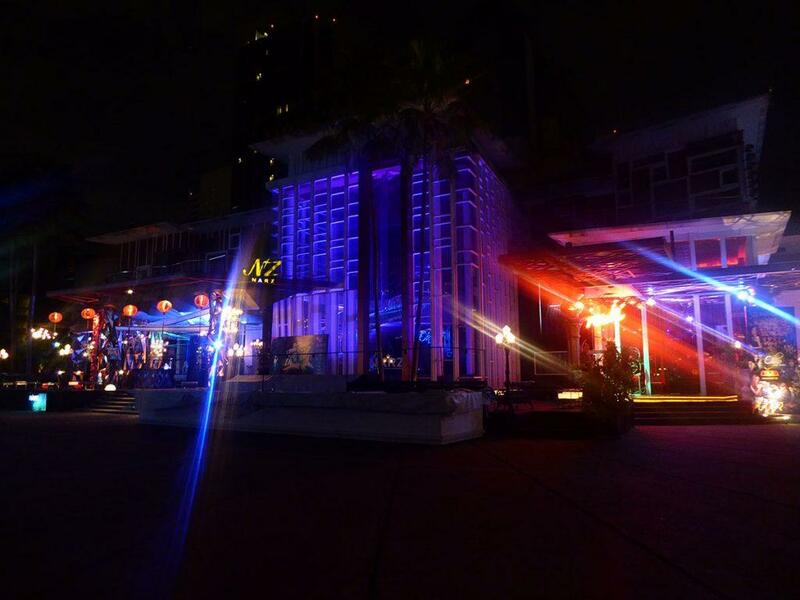 Levels Club & Lounge is located on the 6th floor of the Aloft Hotel on Sukhumvit Soi 11. There are three zones, a smaller dark clubbing room with minimal seating playing EDM, a larger lounge with a central circular bar and booth style seating around the edges playing commercial tunes and hip-hop, and a terraced outdoor bar area with great views of the city. The crowd is a mixture of tourists and locals. Drinks are expensive with beers at 250 baht and cocktails from 300 baht. You will need ID to enter. 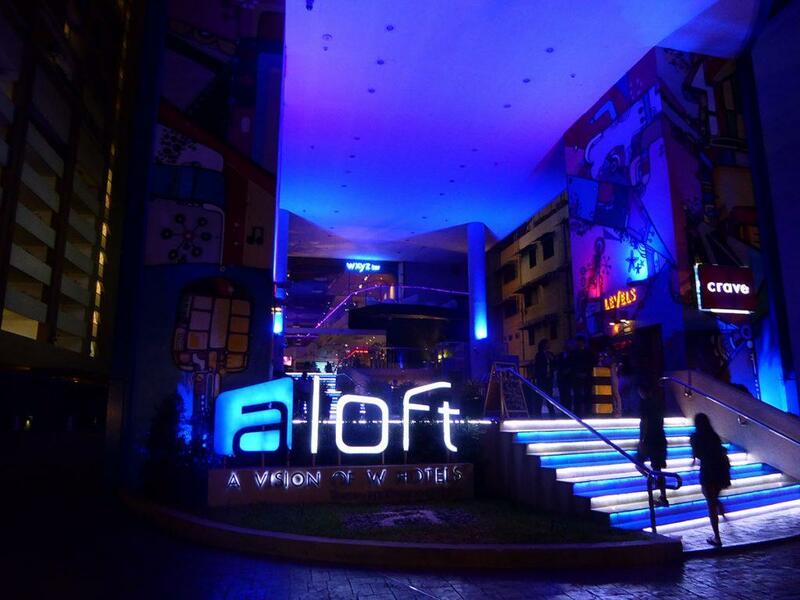 Location: Aloft Hotel (6th floor), 35 Sukhumvit Soi 11. Dress Code: Smart casual (no flip-flops, sandals, caps or shorts). 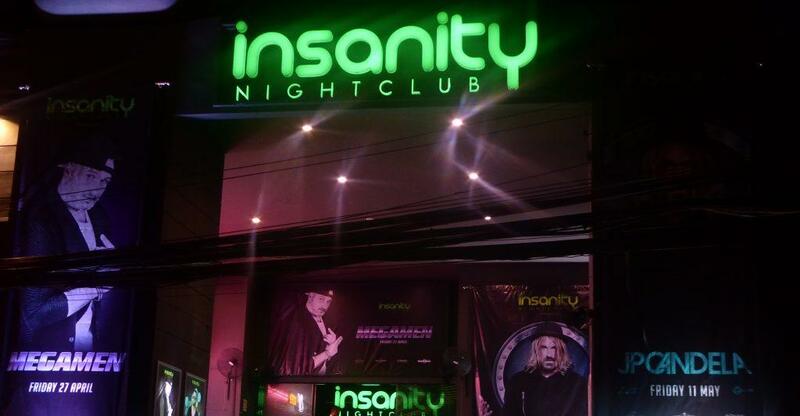 Insanity is a large popular club on Sukhumvit Road near the Asoke intersection. The club is a very large single room playing EDM, house & hip-hop. The DJ’s are both local & International. The atmosphere is good with podium dancers, a great sound system, laser show, and a mixed crowd of locals, expats, and tourists looking for a fun evening. Drink prices are reasonable and run from 210 baht for spirits, 180 baht for beers, 240 baht for cocktails, and 140 baht for soft drinks. There is a happy hour Sunday-Thursday 22.00-23.00 with selected 99 baht drinks. Admission is 300 baht but includes one free drink voucher. A 24-hour American themed restaurant called the V8 diner is attached to the club with decent International food at reasonable prices for pre or post club dining. Dining at the V8 allows you free admission to the club through a connecting side door. Admission: 300 baht with one free drink. Getting There: BTS Nana Station exit 3, then turn left into Soi 11. Insanity is opposite Le Fenix hotel. Royal City Avenue known as RCA is one of Bangkok’s main entertainment and clubbing streets. 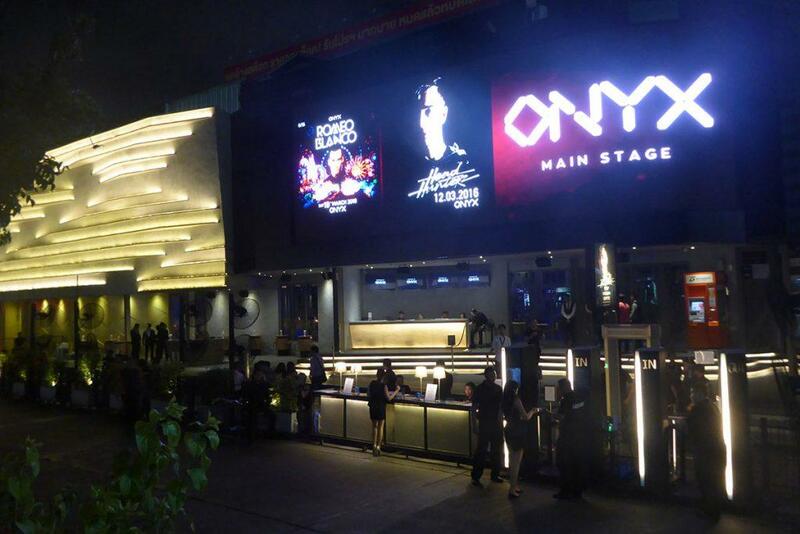 It is home to some of Bangkok’s biggest clubs namely Onyx, and Route 66. The crowd is mostly young locals along with some expats and tourists. RCA clubs are not frequented by working girls. Unfortunately, foreigners need ID to gain entry to all clubs in RCA. This means your passport which is something you don’t want to take on a night out. Admission charges range from 300-500 baht for foreigners (free for Thai’s) depending on the day of the week and the event/DJ. This usually includes one or two free drinks. Don’t expect friendly service or security staff. Onyx is an Ibiza style large multi-level room that holds 2000 people and has a world-class laser show and sound system. There are a large outdoor terrace and an upstairs balcony. The music in the main arena is bass heavy house while there is a second small room at the back of the club playing deep house and trance. Top world famous DJ’s often play at Onyx. The crowd is a mixture of locals, expats, and tourists. Drink prices are reasonable starting at 160 baht for a beer. The foreigner admission fee is 300-500 baht includes one or two free drinks. Route 66 is a Thai style club with closely packed tables and no real dance floor as in more International style clubs. There are two rooms open from Sunday-Thursday, one playing hip-hop, dance, and R ‘n’ B while the other has live Thai bands playing both western and Thai songs. At the weekend, Route 66 opens some smaller specialty rooms featuring house, electronic and trance. There is an outside terrace at the front of the club. Drinks are reasonable and start at 160 baht. The foreigner admission fee of 300 baht includes one free drink. Route 66 can be uncomfortably crowded at weekends. The crowd is mostly young locals. Location: Onyx & Route 66 RCA (Block A). Close to Rama 9 entrance. Admission: 300-500 baht for foreigners (includes drink vouchers). Higher prices for International DJ events. ID required (passport). Getting There: Taxi from MRT Phra Ram 9 or MRT Phetchaburi stations (50-70 baht). The Lava Gold is a late-night dance club on Khaosan Road attracting a young international crowd of locals and tourists. 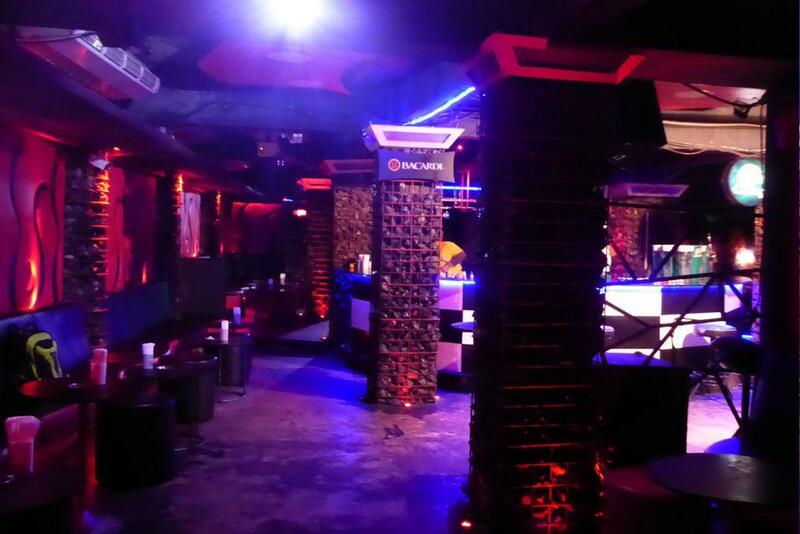 The club looks like an underground temple with its blue and lava red lighting. The DJ’s play EDM, house, and hip-hop. There is seating around the walls and a central bar. No dance floor but people tend to dance around the bar or their tables. There is also a quiet seating area and a pool table. Lava can get crowded at weekends and late at night. Drink prices are reasonable starting at 150 baht for a beer and 200 for cocktails. Good atmosphere. Location: 249 Khaosan Road. The basement of Bayon Building. 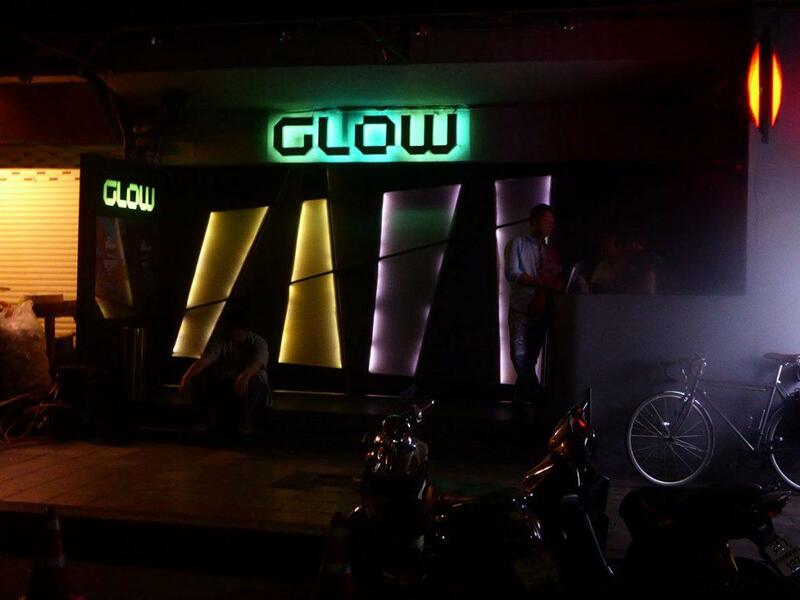 Glow is a small intimate two-floor club on Sukhumvit Soi 23. The music policy is cutting edge underground house & techno with regular appearances from International DJ’s. The ground floor has a bar with a small dance floor lined with comfortable seating while the first floor has more seating and a balcony overlooking the dance floor. The crowd is a mix of friendly locals, expats, and a few tourists. If you prefer small clubs with non-mainstream music you will like Glow. Drink prices are reasonable. Watch out for Thai DJ Nakadia who often plays here. Location: 96, 4/5 Sukhumvit Road Soi 23. Admission: 200-300 baht including a free drink. BTS Asoke (exit 3) cross the intersection and continue up Sukhumvit road, turning left into Soi 23. Turn right opposite the Clubhouse Pub and then take the first left. Glow is just around the corner. MRT Sukhumvit (exit 2). Walk up Sukhumvit road, turning left into Soi 23. Turn right opposite the Clubhouse Pub and then take the first left. Glow is just around the corner. 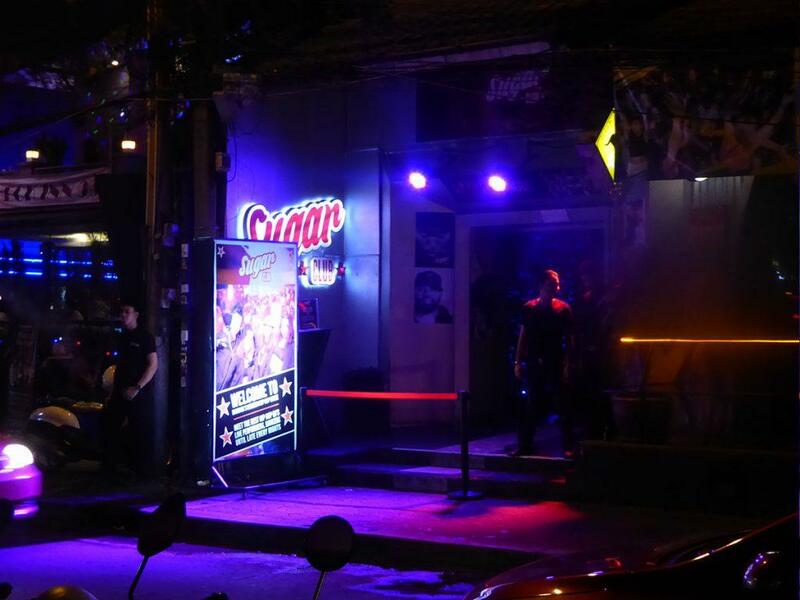 Sugar Club is a late-night club located on Sukhumvit Soi 11. The music is strictly hip-hop. 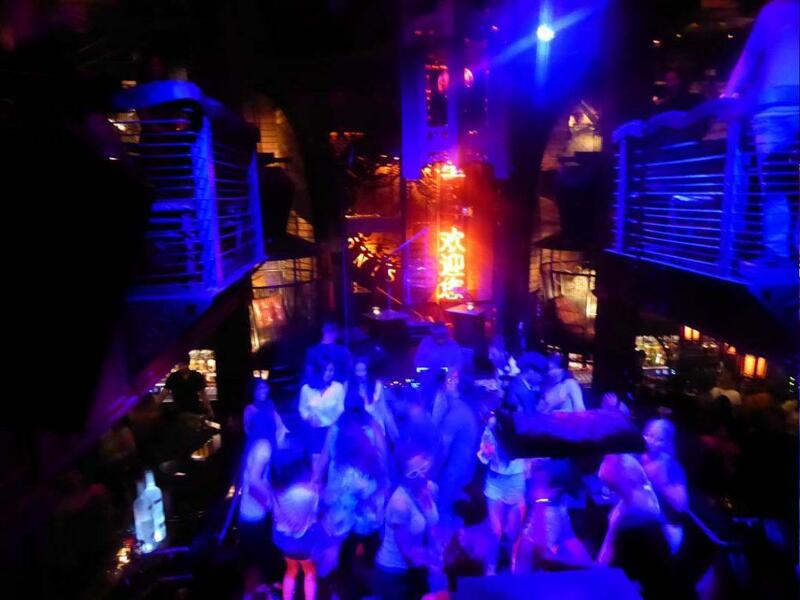 The club has a central dance floor and circular balcony and boasts a top-class sound & light system. The central stage has professional dancers to keep the party swinging. There is no seating except for VIP tables which require purchasing a premium bottle of spirits. The crowd is a mixture of locals, expats, and tourists as well as the usual Sukhumvit working girls. Drink prices are reasonable before midnight and can be expensive thereafter, though there are some good drink deals on offer. Wednesday is ladies’ night with 3 free drinks before 01.00 as well as 5 drinks for 500 baht deal all night Sunday-Thursday and before midnight on Friday-Saturday. The normal entrance fee is 300 baht for men and 200 baht for women with both including a free drink. The Sugar Club entrance is next to the Australian pub. Location: 37 Sukhumvit Road Soi 11. Admission: Men 300 baht including a free drink, Ladies 200 baht including one drink. Narz is a long-running (since 1992) stylish upmarket club housed in a mansion style building on Sukhumvit Soi 23. It has 3 club rooms spread over 4 floors each with a different musical style. Downstairs plays trance while the middle room plays hip-hop and the upstairs room plays house. Narz has a hi quality sound system and hi-tech lighting and lasers. Many Internationally famous DJ’s play shows at Narz. There are 8 bars within the club, a large outdoor seated area on the ground floor and seated balconies on the upper floors. The crowd are mostly young fashionable affluent locals and local expats especially Japanese and Koreans. Most people arrive after midnight as the club stays open until sunrise. Drinks are expensive with beers starting at 200 baht. Friday is models night. Location: 112 Sukhumvit Soi 23. Admission: Free before 22.00. After 22.00 400-500 baht including 2 free drinks. Admission may be higher for special events. BTS Asoke (exit 3) cross the intersection and continue up Sukhumvit road, turning left into Soi 23. Turn right opposite the Clubhouse Pub and Narz is about 200m on the right-hand side. MRT Sukhumvit (exit 2). Walk up Sukhumvit road, turning left into Soi 23. Turn right opposite the Clubhouse Pub and Narz is about 200m on the right-hand side. Sing Sing Theatre is one of the hottest and most unique clubs in Bangkok. The extremely creative interior design by Ashley Sutton is Chinese themed, evocative of old 1930’s Shanghai. 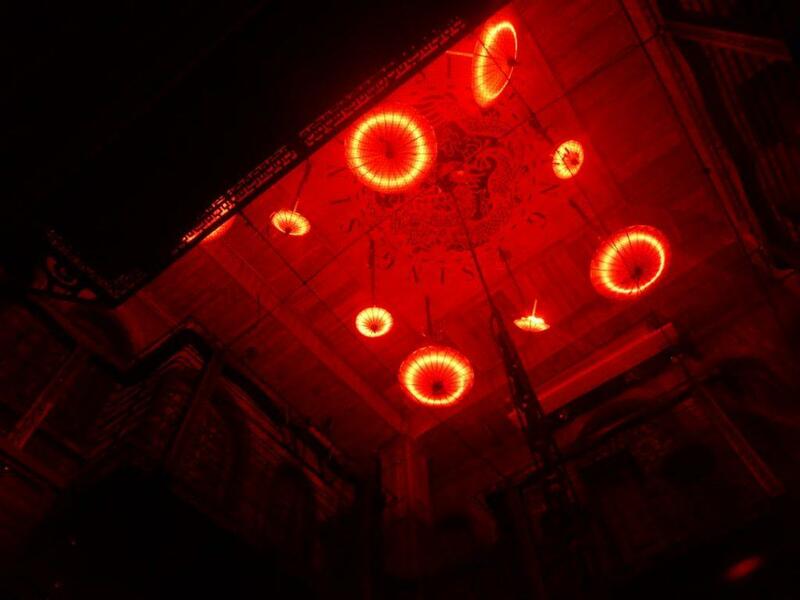 The décor consists of wrought iron patterns, oil paper umbrellas and red lanterns hanging from the ceiling, birdcages, dragon imagery, rotating turbine fans all bathed in a dim red lighting. There are a central dance floor and stage with small bars either side with seating. The upstairs balcony overlooks the dance floor and there are many dark corners and several single table private balconies. The club draws a mixed crowd of locals, expats, and tourists and the small dancefloor gets crowded by 22.30. Come early if you want a table especially at weekends. Entrance is free but there’s a strict dress code of no shorts, singlets or sandals. Drink prices are reasonable for an establishment of this quality with beers from 210 baht, spirits & mixer from 225 baht, wine 260 baht a glass, cocktails from 355 baht and soft drinks from 100 baht. Champagne is also available. On Thursday nights ladies get 3 free drinks before midnight. The music is mainly EDM with nightly DJ’s with regular appearances by Internationally well-known artists. There are also live music spots and cabaret performances. There are professional dancers who dress in a different theme each night. They can be seen on stage, on the dance floor and even perched on swings above the dance floor. Service is good and the staff are polite and friendly. Address: Next to Quince, Sukhumvit Soi 45, Bangkok. Opening Hours: 21.00-03.00 Tuesday-Sunday. Closed on Mondays. Dress Code: No shorts, singlets, open toe sandals. Rules: ID must be shown if asked for, no outside food and drinks, no under 20’s, no drugs! Getting There: BTS Phrom Phong Station (exit 3). Turn right into Soi 45, Sing Sing is next to Quince on the right-hand side.